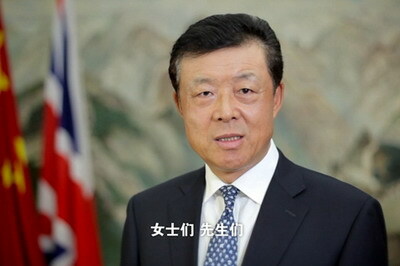 Video Message by Ambassador Liu Xiaoming at the Opening Reception of "Chengdu 72 Hours Experience in London 2014"
Greetings to you all on behalf of the Chinese Embassy in London! I send my very warmest congratulations to the Chengdu 72 Hours Experience! Chengdu is a city rich in history in southwestern China. It has long had a reputation as a "paradise on earth". This is a city of harmony between nature and culture. It is a city of great attractions and can boast about a unique blend of traditions and dynamism. The charm of Chengdu lies in its natural splendor. The city has been richly endowed by nature. This means Chengdu offers a wealth of tourist destinations. These include national rated scenic areas, natural features, with many forest and geological parks. The splendor cannot fail to win over the hearts and minds of any visitor. Chengdu also excels in its cultural riches. With a history spanning over 2,000 years, Chengdu is among China's earliest 'famous historic and cultural cities'. As a result Chengdu is the permanent seat of the 'China International Festival of Intangible Cultural Heritage'. Through this you will find that Chengdu is a city rich in traditions, cultural heritage and world-renowned handicrafts. For example, Chengdu is famous for its silverware, lacquerware, embroidery, bamboo and brocade crafts. In turn Chengdu offers its signature local cuisine, tea ceremonies, Sichuan opera, shadow puppet play and, last but not least, the giant pandas. Alongside these cultural attractions Chengdu has evolved as a key business centre. Chengdu is located right at the heart of the much desired market in China's Southwest. It has attracted over half of the Fortune 500 companies. Business is prospering with its GDP in 2013 closing in on 1 trillion RMB. In turn, this success attracted major events. Examples are the first Fortune Global Forum and the World Chinese Entrepreneurs Convention. Chengdu has now won a place on the world stage and so is making steady progress towards becoming an international metropolis. Recent years have seen Chengdu's engagements with the UK on the rise. Chengdu and Sheffield forged the bond of twin cities in 2010. During the Chinese New Year in 2013 an ensemble from Chengdu toured many cities in the UK. The Chengdu Art Exhibition also left a deep impression on people here in London. Also in 2013, Chengdu implemented a 72-hour visa free transit policy. At the same time British Airways opened direct flights between Chengdu and London. This has just been upgraded from 3 flights a week to 5. These shared developments have enabled further engagements between Chengdu and the UK. It is particularly worth mentioning that late last year, I had the honour to accompany Prime Minister Cameron to visit Chengdu. The visit very much strengthened Britain's contacts and exchanges with Chengdu. But the visit has also been a great boost for raising the fame of Chengdu 'hotpot' in the UK. The Prime Minister's 'hotpot' meal has since become a most sought-after set menu. For myself, the charm of Chengdu can go on and on! But, Chengdu 72 provides a valuable opportunity for British people to experience what the city offers. Of course, we look forward to more and more British people visiting Chengdu! That is the best way to learn about the many charms of Chengdu! Finally, I wish Chengdu 72 a great success! May the exchanges and cooperation in many fields between Chengdu and the UK yield very fruitful outcomes.